The recent teeth you did were great! You have always conducted an absolutely excellent practice and your reputation is perfect for your dentistry and the way you honor those you come in contact with each day. I congratulate you on completing the Concept of Complete Dentistry Series in advanced dental studies at the Dawson Center. It is fulfilling for us, as faculty, to have doctors like yourself pursue advanced education in order to provide the very best care for your patients. Your commitment to your patients and your community is obvious not only to your efforts in the classroom, but also in your enthusiasm for pursuing excellence in everything you do. Dr. Garcia and has been my dentist for the last three years during which he has literally reconstructed my mount & smile. From old crowns and broken down bridges to state of the art ceramic crowns & bridges. There is no comparison between the aesthetic quality and strength of the work he’s done and what I’d had done over previous decades. He is hands down the best cosmetic dentist in the state or anywhere. Reasonable in what he charges and a caring & very amiable person. THE BEST. The staff at Dr. Garcia’s dental office is great. They really care about their patients. Dr. Garcia is the best dentist I have ever had work on my teeth. I’ve had problems with my bite all my life and have visited countless dentist with various problems, but it wasn’t until I went to Dr. Garcia that I found someone with the knowledge, skill, and dedication to take care of my problems. I know when I walk in his office that I’m “not just another patient”, my problems and concerns are given very special attention. Dr. Garcia and his staff care about the comfort and satisfaction of their patients. This is the most unique dental office I have ever had the opportunity to visit. This is where you go if you care about your teeth and want the best work done. Dr. Garcia has fulfilled a long-time dream of mine to have a beautiful white set of teeth. He is certainly not satisfied until he reaches perfection. I also appreciate the friendly and professional demeanor and the expertise of Dr. Garcia and his staff. I appreciate what Dr. Garcia has done for me and would gladly recommend him to anyone. -- Esther D. Davis, Ph.D. I had not seen a dentist in over 20 years, my fear was overwhelming. One day I received a letter in the mail from Dr. Garcia’s office, I took a look at my smile—ugh. I schedule a visit and I believe it changed my life. The people I worked with were very knowledgeable, professional and courteous. Most of all they were sensitive to my issues with pain and being uncomfortable. They transformed my look from meek to confident. The experience was well worth the effort and I met really great professional individuals. I just wanted to send you a “note” of thanks. I also want to say thank you for your attention to detail or details. Being conversative on invasive treatment and preserving as much as possible is much more reassuring and say’s a lot about you. “Thank You”!!! Keep up the good work, it show’s!!! Kind Regards. Dr. Garcia and his very able staff demonstrate a wonderful and appropriate blend of caring, concern, professionalism and humor. I am completely satisfied with the results of their care. Dr. Garcia made a difficult decision concerning my dental problem seem easy after it was completed. I can’t express to people enough how Dr. Garcia and his staff were so understanding and great! My dental work done by Dr. Garcia makes me feel like a million bucks every day of my life! Thanks a lot! I’ve always been very well taken care of with Dr. Garcia and his staff. Very Professional. I had lower implant surgery done two years ago and I’m so glad I did. The procedure recovery was fairly quick. There is nothing I’m not able to eat now. Basically I’m enjoying better quality of life with these lower dental implants and I would recommend it. I really do not look forward to going to the dentist, but when I just came to this practice I was amazed. They are all very good at what they do. From the reception to the chair, everyone heals you so well. I hate my teeth being cleaned, but it has been a very good experience here. The dreaded injections prior to fillings, I really do not like, you will feel nothing at this practice, extremely good. Everything was great. Staff, as always, were pleasant and interested in me as a person, not just as a patient. Quality of work – superb! Keep up the GREAT work. And many thanks for being so nice!! !” For the seven years I have been seeing Dr. Garcia, I have found he and his staff to be competent, caring and professional. The quality of their work is excellent. Also, I am treated as a person, not a number. He is the best dentist I have ever had. Dr. Garcia has been our family dentist for 14 years. I have come to place my confidence and trust in his professional competence and skills in all areas of dentistry, in his keeping abreast of cutting edge developments in the field. He is without question a professional of the highest order, in the quality of services he and his staff delivers, in the regard for the patient demonstrated. 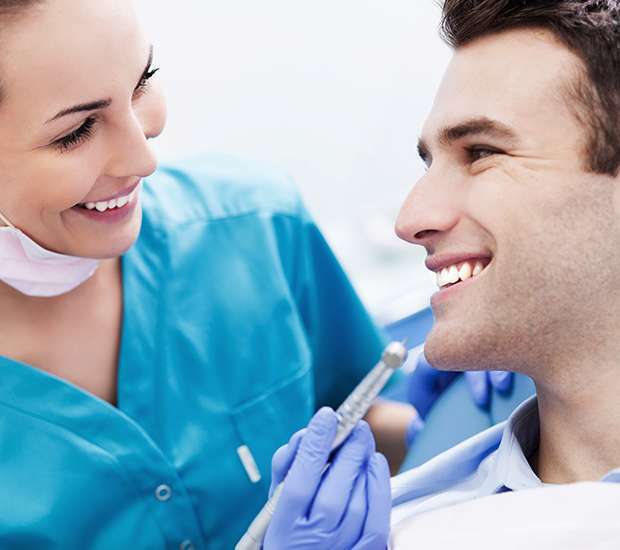 His staff are beyond friendly, compassionate and caring, they have become like an extension of our own family over the years, such that I can honestly say “we enjoy coming to the dentist.” I have had occasion to obtain second opinions in the past. There is no other dentistry practice in Albuquerque with which I would consider placing the dental health of myself and my children. The best service I have ever had, wonderful caring people! I am here to stay. They always do what is best for us. Thank you to everyone, you’re the best! My experience in taking care of my dental needs turned out just great. Thanks to Dr. Garcia and his very professional staff, who made my dental procedure a relaxed and comfortable one and due to this I was able to heal fast and my soul healed too. They were all so professional in their work, preparing me for what I was to undergo in my dental care and treating me not only as a patient, but also as a person. I recommend this dental office to anyone who is looking for a relaxed and very professional atmosphere because it helps you to heal faster. I am so happy that I chose to come to the office of Roderick A. Garcia, DMD. Everyone was wonderful. Thank you for fixing my teeth. My front teeth had been damaged in a motorcycle accident several years ago and I had never gotten around to having them repaired correctly. When one of the old “fixes” fell off I called your office (at the urging of a business associate whose wife’s teeth you had worked on previously) and your staff was very helpful working me in the next day. I wanted to publicly thank you for helping me on such short notice, the quality of your work and the professionalism of your staff is comforting. Besides my wife, who I consider my most important critic, I have had several friends and associates complement my “nice smile”. Additionally, I am most impressed with the new found functionality of my bite and the teeth that you repaired. Yesterday I called your office and told your receptionist that I had a small spot on the back of one of my teeth that was bothering me so she had me come in at 10:00am this morning. It didn’t take but a few minutes and the rough spot was history. In addition to your exceptional work I have never had to wait more than a bout give minutes at your office, even your staff scheduled me in at the last minutes. I really appreciate it. Thank you again. Everything about this experience has been great. Your smile is the first thing many people notice and for a long time, my smile was an embarrassment to me. The transformation of not only my smile but attitude and self-confidence has been noticed by most of the people I interact with on a daily basis. It is so nice to feel pretty again and not concentrate on keeping my mouth closed when I smile or laugh. Everybody in this office is GREAT!! With all the time I have spent here over the last several weeks, I have got to know Dr. Garcia and his staff very well. I am so glad I found this practice. I like the personal attention and the professionalism. The procedures are explained well and the personnel are extremely pleasant. It is a very friendly atmosphere and it was a pleasure to find this office after moving to a new town. They’re awesome – extremely good. We stumbled on this practice because it was close to our home. When inquiring by phone it meant a great deal to me that Dr. Garcia not only received his training at Tufts University but also continues to pursue continuing education. I love the staff and the friendly, professional manner in which you treat patients. If problems arise, patients are seen quickly. My treatment overall has been outstanding. My feelings about my dental procedures are excellent. Keep up the environment of care and belonging. GREAT!! I’m not as anxious about going to the dentist anymore. Very pleasant, I felt very comfortable. I would recommend Dr. Garcia. I’ve been very satisfied with Dr. Garcia’s dental work. I smile more and continue to get compliments! Excellent customer service from the beginning. The entire staff is personable, reassuring, and professional. Not to mention my teeth came out great. The best dentist I’ve ever been to, clean, professional, and great results. I like going to the dentist now! Thank you! I like how everyone is nice and welcoming every time I come in. Also, I like how everything is done to make me happy. It’s a pain-free appointment. Staff is warm and friendly. Dr. Garcia knows what he’s going and didn’t hurt me, which was great. Everyone was very informative and explained everything that they needed to do for my teeth and why and they made sense. Since I have TMJ and have had to help by TMJ specialists in the past, I was very impressed with Dr. Garcia. Dr. Garcia not only sounded knowledgeable, but what he was saying made sense and has worked. What do I like about this practice? Let me count the ways: 1st: Great Dental Work, 2nd: Great Dnetist, 3rd: Great Assistants. After a major accident which knocked out all my upper teeth; Dr. Garcia replaced a temporary bridge with a permanent one. This was many years ago and have never had a problem since. Everyone here is so friendly and fun and caring. It makes it (almost) a pleasure to come to the dentist! Also, it’s evident that everyone cares about what they’re doing—doing it right and without pain. Please stay in practice a long time so I don’t ever have to go to another office! Dr. Garcia and his entire staff are the most experiences and competent that I have had the pleasure of being associated with in the past several decades. I highly recommend Dr. Garcia for everyone contemplating new or on-going dental work. I like everyone that works here. All of the staff is positive, up beat, and professional. I felt cared for on a personal level. Thank you so much! The staff is courteous and always makes us feel important and like part of the family. Very friendly and warm dentist, as well as all staff member. This practice is friendly, quick, and has excellent customer service. Dr. Garcia explains what needs to be done and why in very understandable terms. The front office people are very friendly and helpful. The staff and Dr. Garcia are all very caring and customer focused. This is the first dental office I have actually enjoyed coming to for treatment. The staff is very friendly and helpful and provide a calming atmosphere. I am completely happy with the care I receive from Dr. Garcia and his staff. They are true experts in their profession. They are always friendly and courteous. They are very well organized and work together like precision clockwork. They are all friendly, kind & caring people and they make having extensive work done a painless & pleasant experience. They worked miracles on me teeth and I think they are all great! I have been afraid of dentists since childhood, but during the last couple of years, my teeth seemed to go downhill fast in health and appearance. A friend had recently had work done by Dr. Garcia and persuaded me that I would be in good hands. They have such a “caring attitude”. Not only do they promise and strive hard to make your visit painless and as pleasant as possible, they really care that you are comfortable, pleased with the work, and are not afraid to return. There is very little room for improvement what a practice has competent, skilled and caring people with acute attention to every detail. Thank you again. Dr. Garcia has given me a confident smile for the first time in 55 years. I want to thank you again for the outstanding work that you have done for me. Tell everyone on your staff thanks for the hospitality and professionalism. Dr. Garcia is the finest cosmetic dentist I have known. My results werw excellent. His staff is also very personable and highly trained in their areas of expertise. I recommend his services highly. I have received nothing but first class dental care from Dr. Garcia and his colleagues. I recommend them without reservation. After 14 years, Dr. Garcia’s practice has become part of our family! They have all worked together as a team of professional’s to give me a professional smile! Thank you for all you have done for Steve, Barry, Chris and Cindy since 1990. Oh, what a new smile I have now! Thanks Doc! Dr. Garcia and his staff are terrific. I cam to them with the dental equivalent of “this old mouth” that needed both restorative and corrective work. After restoring several problem crowns and gun areas, I am eating foods impossible to chew before I came here. And more importantly, my special lady enjoys me more. Thanks Dr. Garcia and his excellent team for improving my smile.